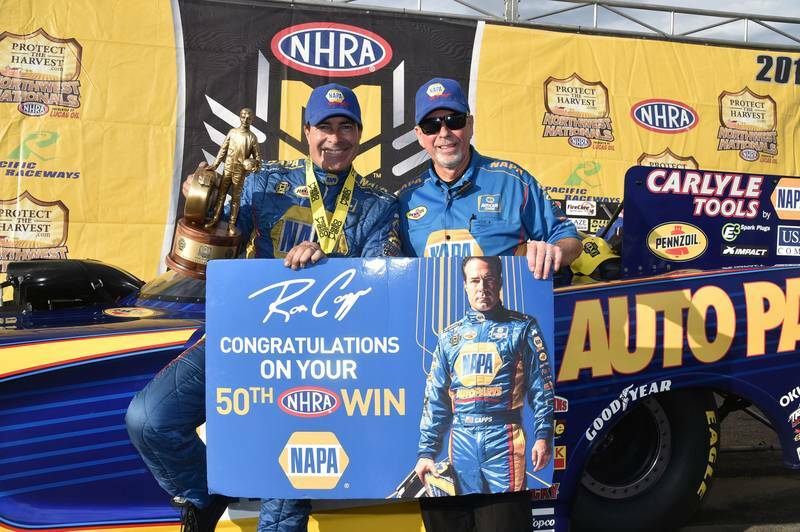 BRAINERD, Minn. (Aug. 20, 2016) – Winner celebrations rarely happen on Saturday of an NHRA Mello Yello Drag Racing Series event, but Ron Capps and Don Schumacher Racing’s NAPA AUTO PARTS Dodge Charger R/T team led by crew chief Rahn Tobler wrapped up the title Saturday from the rain-delayed Seattle event that started two weeks ago. 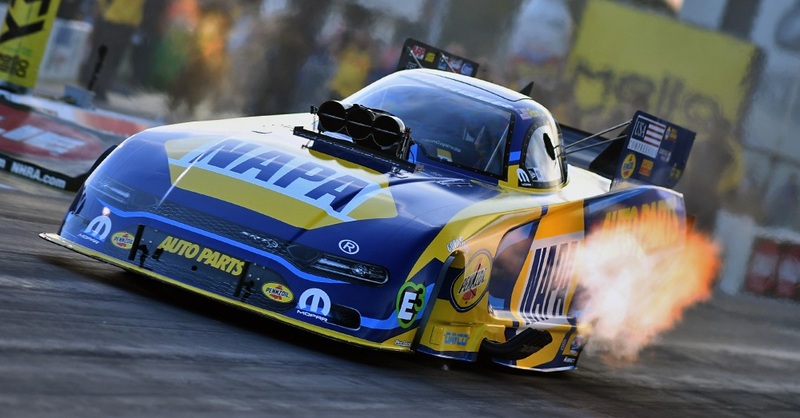 It was Capps’ fifth title of the year in 16 races and 50th of his career that enabled him to extend his lead in the Mello Yello Funny Car category to 209 points over Courtney Force with two events remaining in the regular season that includes Sunday in the NHRA Nationals at Brainerd International raceway in northern Minnesota. 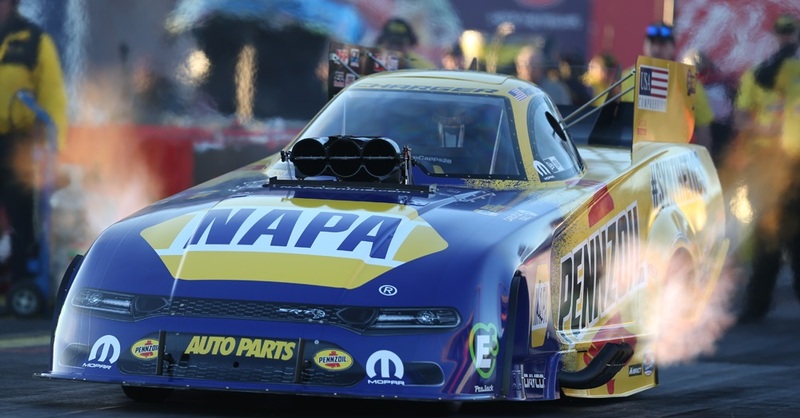 But when he faced Del Worsham Saturday in the rescheduled championship round, Capps looked like anything but a rookie. 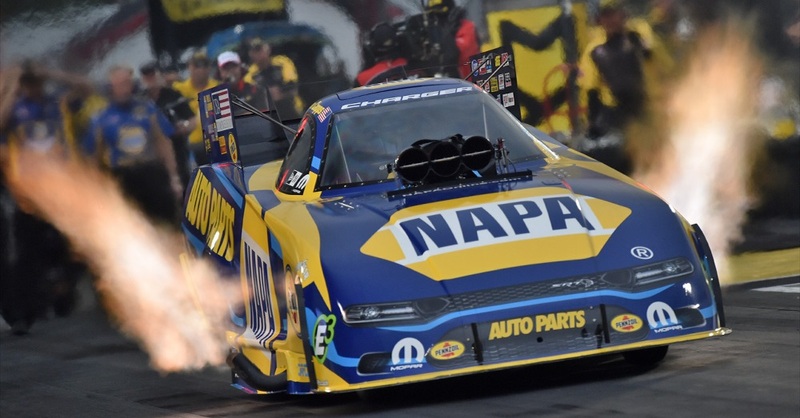 At the start, Capps briefly lost traction but was instinctually able to regain traction and held it for the win when Worsham lost traction further down the track and was unable to regain momentum. 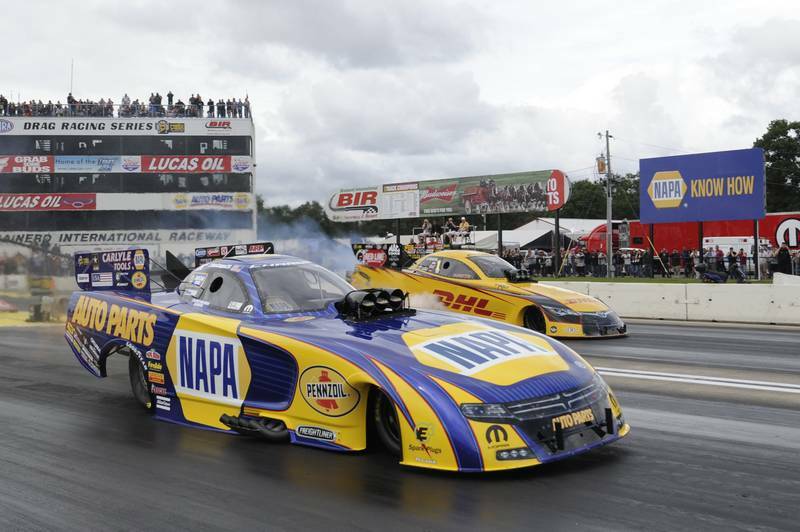 Capps run was 4.014 seconds at 322.42 mph while Del Worsham slowed to a 6.010 (133.58). After record-setting conditions at Seattle, a trickier track was presented to the finalists. A big downpour fell on the track about 15 minutes before Capps and Worsham were to run and then endured a 90-minute delay. 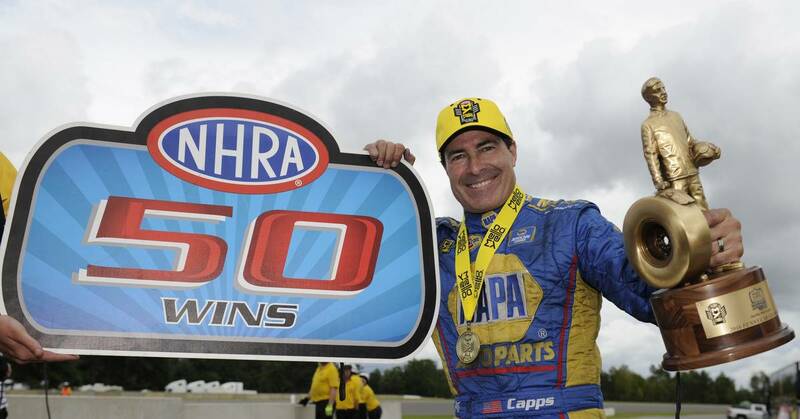 “My firesuit got soaked and I had to hang it out to try to dry it out,” said Capps, who qualified No. 5 for Sunday at Brainerd. “When I did my burnout some water fell from under the body and some of that might have gotten on the track. “Del’s been running good at Seattle and here. I was preparing for a side-by-side, quickest ever Funny Car race. I knew it was going to be one of those runs. It was so anticlimactic not to throw-down with low 3.80s. DSR teammate Antron Brown added the Top Fuel title from Seattle to provide DSR with its fifth nitro sweep of the season and 57th since 2003 in the NHRA Mello Yello Drag Racing Series. 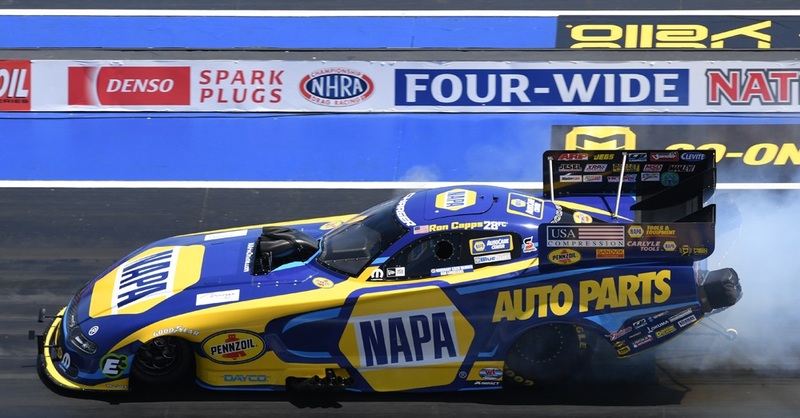 The Seattle rain postponement seemingly was Mother Nature’s payback for 2014 when Capps was scheduled to race John Force for the trophy but the final was postponed by rain until two weeks later at the U.S. Nationals when Capps won the title. 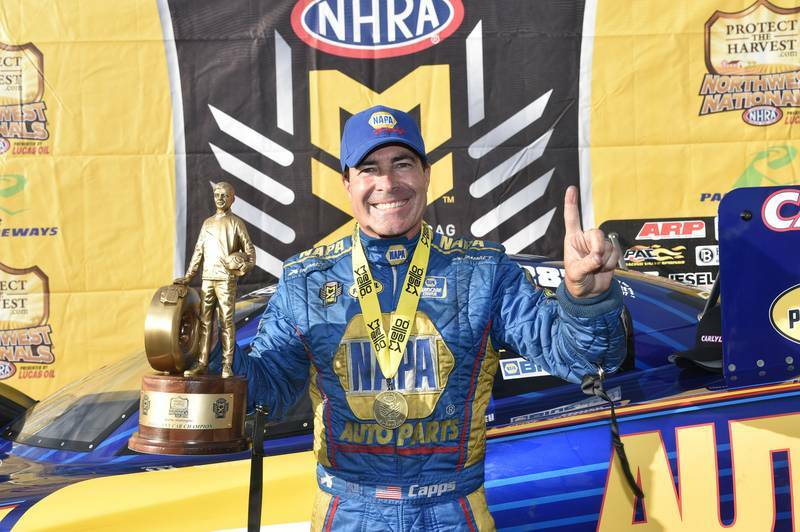 He then shipped the NHRA Wally Trophy to Brainerd, Minn., for a tour of NAPA AUTO PARTS and NAPA AutoCare locations. “It was only fitting after what happened two years ago that we can celebrate this with our great Brainerd fans and all of our NAPA family who come out here to support us. On Saturday in northern Minnesota, fans got payback and now want a weekend sweep on Sunday.